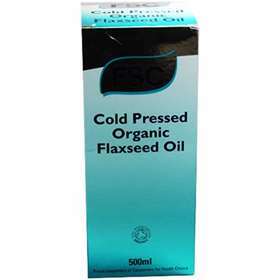 FSC Cold Pressed Organic Flaxseed Oil 500ml A daily dose has shown that it may be healthy for improving on symptoms of mild menopause, such as hot flushes and uncomfortable sweats. Good evidence has also been discovered proving flaxseed oil may lower cholesterol levels and assist in decreasing the risk of heart disease, and to help improve kidney function in people with lupus. Part of a 'well being' program and an essential for supplementing the daily diet. Great for supporting the condition of joints. Helps the minds cognitive function. For all round general well being. Adults and children over 12 years of age; Take one 5ml teaspoon twice daily, preferable with a meal. Do not exceed the stated recommended dose. Keep supplement out of sight and reach of children. Food supplements should not be used as a substitute for a varied diet and a healthy life style. If you suffer from epilepsy, consult your Doctor before taking this product. Once opened consume within 4 to 6 weeks. It may be frozen to prolong the life of the oil. Organic Flaxseed Oil. Cold pressed oil from organically grown seed.